Models - a set of Backbone models, here the data structure in each of the model definition is of a simple object containing few keys. Collections - a set of Backbone collections. Collections would contain an array of objects. Views - a set of Backbone views. These views would have a dependency on the collections, models and templates. It's sole responsibility is to listen to the changes in the Collections or Models and render the page accordingly. Templates - a set client side templates. I have used Underscore.js templates since Backbone already has a dependency on Underscore. Build - the build directory would contain the optimized code (created using Require.js optimizer - r.js). The 'subscribe' method first checks whether the specified 'eventname' already exist. If not, then it creates an entry in the events object. The value of this object is an array of subscribers. Here you also check whether the event was already published. If it has been published then the subscriber would get the published data as soon as it subscribes for the event. This is required when you have multiple widgets on the same page and these widgets have subscribed to the 'loadComplete' event of other widgets on the page. These widgets are loaded asynchronously and when the second widget loads it would not receive the 'loadComplete' event of the first widget. Therefore, we store the data published by widgets and provide it other widgets when they subscribe to it. 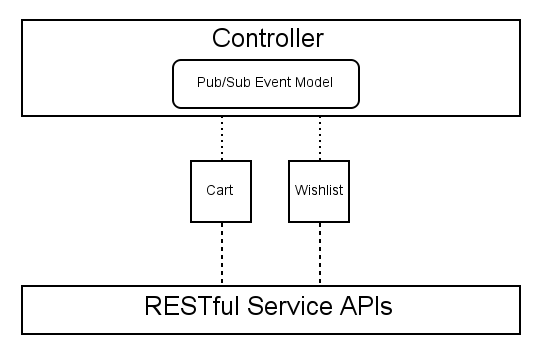 The subscriber's view object needs to implement a custom event (in this case 'movetowishlist'), so that when the event is published, the Controller would invoke this event on the subscriber's object. The publish method checks if the specified event already exists in the 'events' object and then iterates over the list of subscribers and publishes the event on the subscribers object. It then stores the published data in the 'publishedEvents' object, this is required for 'loadComplete' events. The publisher - subscriber event model helps in decoupling the widgets on the page, allowing you to reuse them wherever required. The Controller here acts as a mediator between different widgets on the page and provides a communication channel for these widgets to interact with each other.